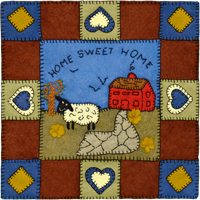 The New England block is the first square in our Home Sweet Home series. This is a medium skill level kit as it uses four stitches – the back stitch, chain stitch, French knot, and of course the blanket stitch. They can be used individually as a wall hanging, a throw pillow cover, as a decorative place setting or table mat, or joined together to make a larger hanging, banner, or even a quilt or bed cover to reflect where you live, where you dream to visit, or perhaps places you did visit or just show off homes across our great nation. It can also be used as a place to show off your quilt show pins, collectible pins, Disney® pins, Scouting mothers pins, or others. Just attach one in each empty square to start, expanding into the filled squares. If you run out of room just make another square, either another New England or one of the next squares in the series. 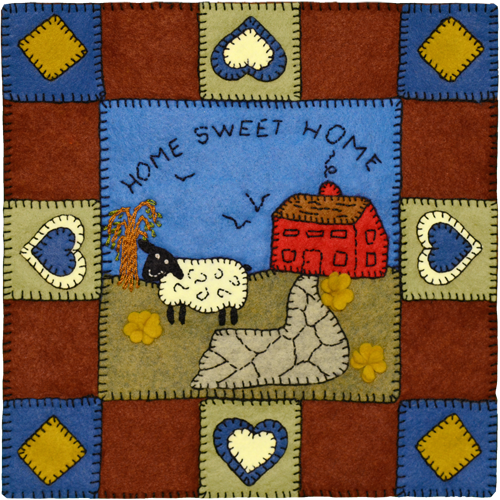 It makes a 10″ × 10″ (25 × 25 cm) block and includes a full backing to cover all of your stitches.